Ronnie O'Sullivan beat Judd Trump 10-9 on the final black in a thrilling Tour Championship semi-final in Llandudno. But O'Sullivan - seeking the world number one spot with a tournament win - found a 130 clearance followed by 134. 'The Rocket' claimed five of the last six frames and pounced when Trump missed yellow for match ball in the decider to win through to the final. That encounter will struggle to match the drama O'Sullivan mustered in a fightback which saw him fall more than 50 points behind in the decider when he was penalised for his waistcoat making contact with a ball. 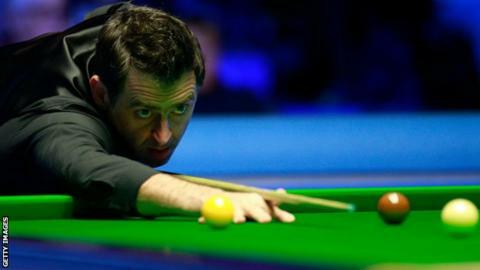 O'Sullivan showed moments of his fluent best, taking the first frame of the evening session with a break of 82 in around seven minutes, while his 130 clearance took a similar time. Trump will rue missed chances and occasional poor fortune, notably when he cut home a key blue which would have given him an 8-4 lead, only to see the white disappear into a pocket, allowing O'Sullivan to move within just two frames rather than be four down.